All of TeamBuilding Unlimited's entertainment events are customized to include the theme of the meeting/event, agenda, goals and objectives, specific jargon, culture and personalities, as well as the venue. 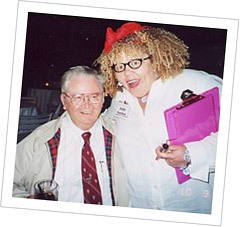 Janet Rudolph, founder of Murder on the Menu, expanded the entertainment offerings to meet the needs of our clients. All of our performers, musicians, Audio/Visual staff are professionals with many years experience in interactive theatre as well as improv. 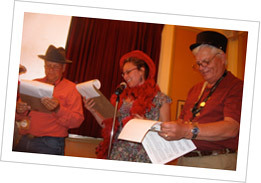 Murder on the Menu, Hollywood Casting Call and American Team Idol can also be used as TeamBuilding events! TeamBuilding Unlimited is based in San Francisco, but we travel all over California and the United States to make our clients' meetings, incentives, and special events full of fun and surprises. The following are just a few of the special types of entertainment we offer. Call or email for more information or fill out a Request for Proposal. Murder on the Menu, California's #1 mystery company, will provide you with an interactive customized Murder Mystery event focusing on your goals and objectives, jargon, theme and specific guests. Enhanced with professional actors, directors and Audio/Visual equipment, your guests become the stars as they become involved in the "Crime of their Life." Actors, coordinator, audio/visual with speakers, microphones, spotlight, tech, prizes for the winning team and much more! Hollywood Casting Call: Auditions, Music and More! 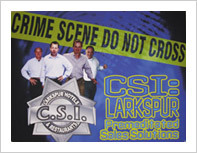 Does your company lean more to Sci-Fi or CSI? In this Hollywood themed Team Builder, your participants "audition" from customized scripts—takeoffs from famous films but that include your company's jargon, people, product and services. Live music, costumes, special "acting lessons" and special "Oscars" make the event interactive, entertaining, hilarious and rewarding. 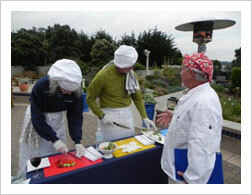 Can be done during a dinner or as its own teambuilding event. American Team Idol, an incredible interactive event, includes team efforts including writings a song about their group, their company, their meeting. Everyone participates—choice of back-up singer, main singer, dancer, choreographer, lyricist. This is a great activity for your next meeting, conference or special event as teams compete to win fabulous prizes in several categories. Points are given for lyrics, style, and creativity. Team Building Unlimited/Murder on the Menu provides M.C. and judges and a keyboardist to accompany your teams. This is rollicking fun and a great teambonding experience that can take place in the middle of a meeting, during dinner or just about whenever or wherever you choose. Being able to dance has become more and more popular. Everyone is realizing how much fun it can be, especially when done with your own colleagues. So You Think You Can Dance: Team Dance Competition can take place in an office, at a conference center, in a ballroom, at your hotel, or even outdoors. Our professional choreographers will help your group explore their creative side! 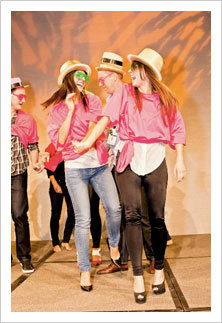 In this amazingly fun team building activity, teams are taught different dances by professional Choreographers. Later in the evening each team performs their dances in front of the rest of the group. Prizes are awarded for the "Best" Dancers. Each team works with a Professional Dance Choreographer to come up with a 60-90 second dance routine. Different dance styles will be incorporated into the instruction and performance. Teams will perform their 60-90 second routine later in the evening in front of their colleagues. Judges will critique each team on originality of the routine and group unity. TeamBuilding Unlimited's corporate team dance program will reinforce work teams by enhancing communication, relationships, self-esteem and social awareness. Corporate participants will strengthen key skills as they listen, learn, persevere, and perform in a relaxed fun-filled environment. Chocolate! The Ultimate Chocolate Tasting! Teams design their own special team hat to reflect their group, company or specific team. All materials are provided including different style hats, feathers, markers, glue guns, glitter. Facilitator assists in helping participants to design, decorate and "don" their very own "corporate" hat. 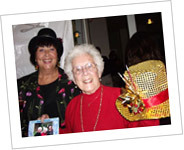 Hats can be worn during a meeting, workshop or special event. A variation: Individual Hats can be designed by guests for Birthdays, Anniversaries, Fundraisers. This is the perfect activity to reinforce a meeting's key points as well as great for a picnic, fundraiser or birthday party. Participants work in teams to "design" a piece of the banner that reflects the meeting, the key objectives, and other relevant points from the meeting. Collectively all the pieces form the "finished" Client Banner that can be taken back to the office. Design and piece together the heart and soul of your company Banner and Fly it High. 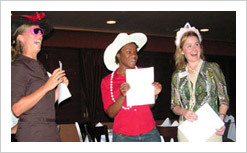 TeamBuilding Unlimited will guide your creativity, provide the materials, facilitate the event. All you need to do is show up and have fun! 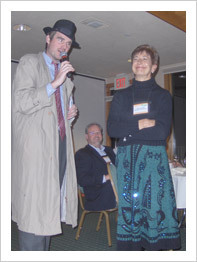 "Detective" crashes the event and "breaks up" the party and "arrests" individually 10-12 of your participants, puts them on trial, asks for testimonials from the other guests. Detective utilizes information about guests, the meeting and more. Detective brings wanted posters, small gifts based on the interests of the guests, certificates and more. Interactive fun and mayhem reigns as the detective grills each "suspect." The more we know about the group, the more fun it will be. Very interactive. Great for retirement parties, anniversaries, new employee events and meetings. Wacky Admin arrives at your party to join your staff. She has done her "research" on many of your guests, and offers them small gifts (based on our knowledge of the recipients) as bribes to be hired. 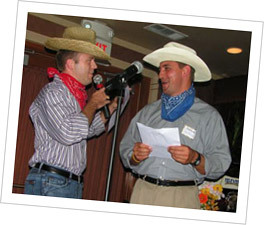 Wacky Admin utilizes information about guests, the organization, your teambuilding goals and objectives. Creative customized and interactive. Scoop, a sensational reporter, roams the party sharing historical facts and tidbits about the Client as well as getting the "scoop" on guests. Vineyard Owner who wants to partner with the Client Company to market a new "Client" wine. Regales group with his knowledge of wine. Fortune Teller dispenses positive, humorous and resourceful futures through palm reading, drink reading, and the like. World Famous Magician in tuxedo, top hat does close-up magic involving and intriguing guests. Beatnik(s) in 60's Hippie Garb wander the room reminiscing about Haight-Ashbury, etc. Uninvited Floozy comes to the party to hobnob with the best in the business. Have something else in mind? Want more information? Email us, call 510-845-3600 or fill out a Request for Proposal. 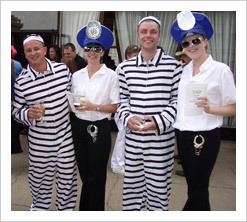 TeamBuilding Unlimited, a division of Murder on the Menu, comes to YOUR location, meeting or conference. Anywhere in the U.S.